Thanks to a persistent east wind, the 5-ish miles between Double Breasted Cay and Hog Cay were in reality 15-miles as we tacked back and forth to get into the harbor under sail. 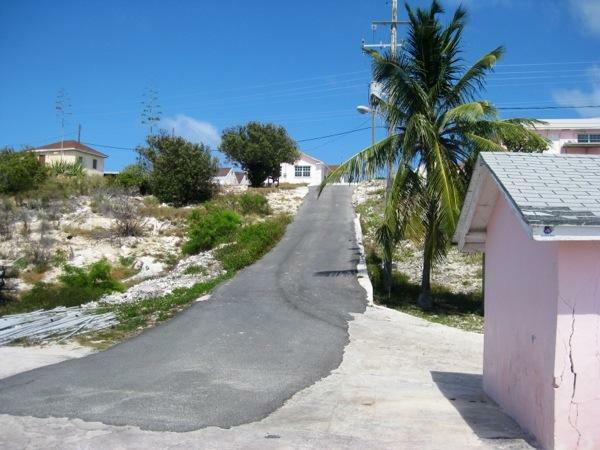 Once settled, we took in our new view of yet another white sand lined cay. There were three neighboring sailboats lingering here near the end of their Bahamian season; we hadn’t time to get acquainted during our brief visit. 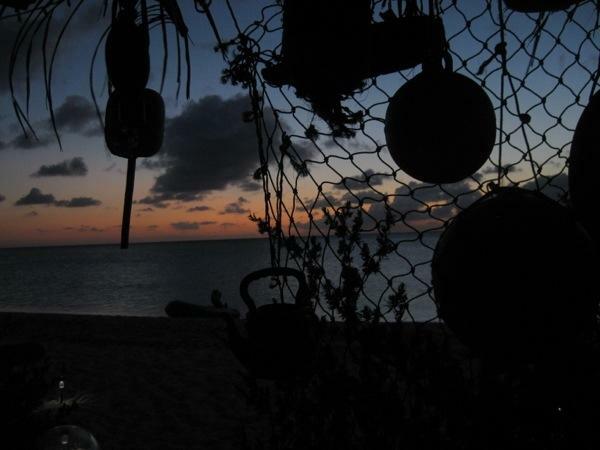 That evening, Serendipity offered us one of our most precious resources…water! After three weeks of use we’d just emptied one of our two 40-gallon water tanks and were happy to accept a 6-gallon jerry can full to the brim with RO (reverse osmosis) water. 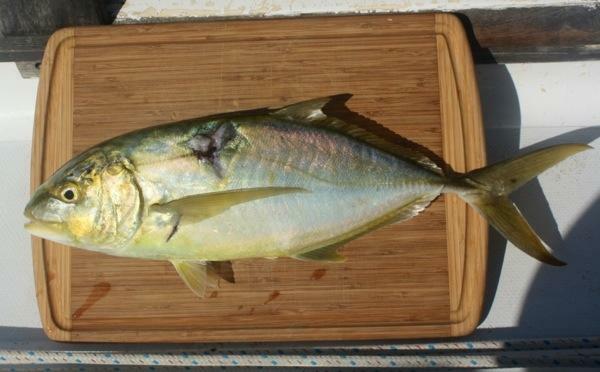 Then another resource, plentiful here in the Bahamas, fish! Brian and I took the dinghy just around the corner for what was his fastest spearing on record. We’d just anchored the dinghy and Brian slipped into the water. Within seconds he’d shot his spear into a school of jacks. Dinner is served! 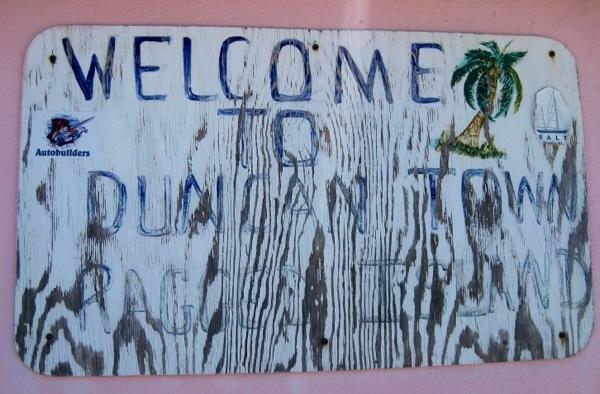 The following day we took a long dinghy ride to the next cay, Ragged Island, where lies the only town in this area, Duncan Town. 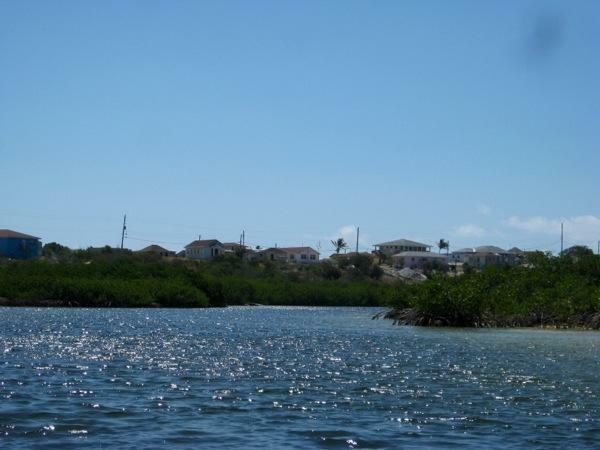 It was about 4-miles into Duncan Town around the point of Hog Cay and then through a long, narrow, mangrove lined channel. To be as efficient as possible with our dwindling gas supply, Jessica and I rode with Matt in their hard-bottom dinghy with the 9hp. With three people Matt’s dinghy could get up onto a plane. 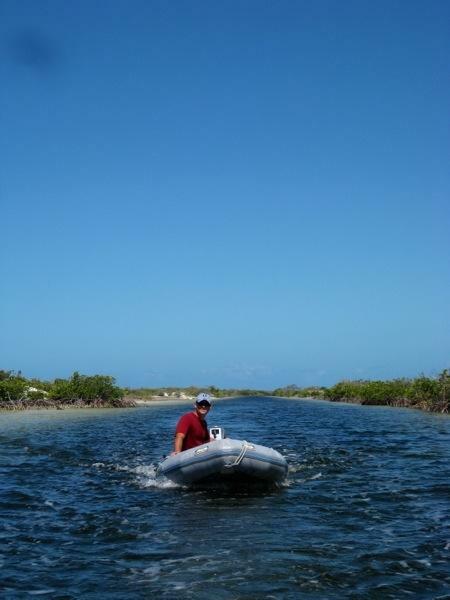 Brian took our soft-bottom dinghy with our 5hp; ours can get onto a plane with one person. Both perfectly balanced we set out. Here is the view of the entrance channel. 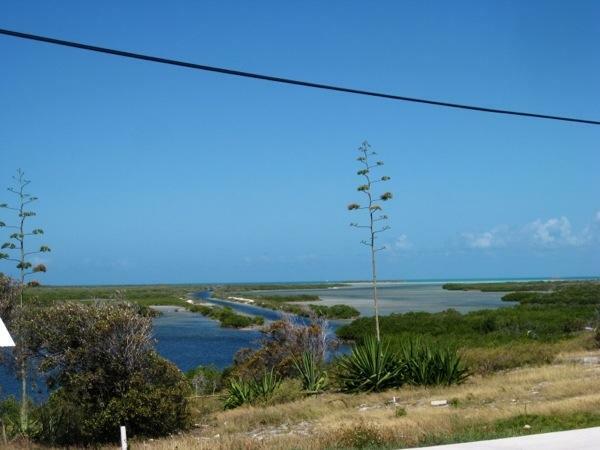 We tied our dinghies at the government dock and walked uphill into town. It was quiet in town. Several goats roamed the streets; several kids were baa-ing for their mothers. 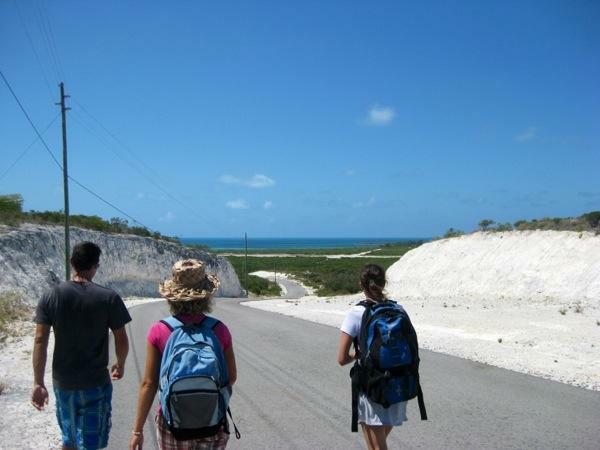 Ahead we could see the ocean side of Ragged Island and at the bottom of the hill was an enormous salt pond. Passing the local clinic, grocery, and bar which were all seemingly closed, we decided to head toward the airport for a tour of the guide book acclaimed Percy’s Eagle Nest. Along our way we discovered that the BaTelCo tower wasn’t working and a repair man had flown in from Long Island. Two women who had driven to the airstrip to watch the plane takeoff had offered us a ride to Percy’s Eagle Nest. We savored our moments in the air conditioned car. We drove into a driveway and honked the horn. Percy and his wife, Elma, greeted us as we walked from the car onto their property. 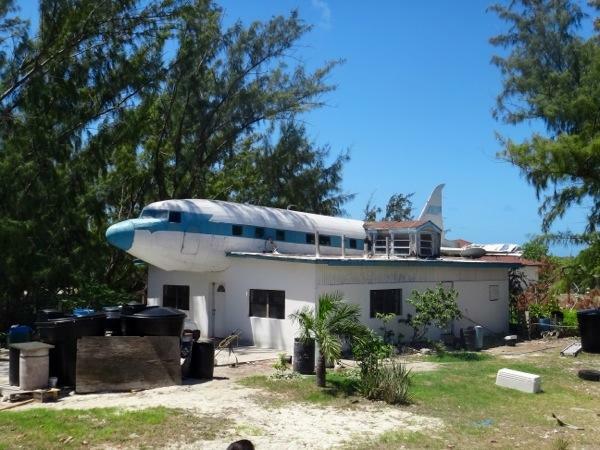 Just as the guidebook had described, there atop the house (which was once an open bar/restaurant) sat a DC-3 airplane; it looked as though it had just crash landed on the roof! This DC-3 had crashed on the airstrip, as Percy explained to us, and was his inspiration for a bar/restaurant. Unfortunately, after a fire the bar/restaurant had to be closed. 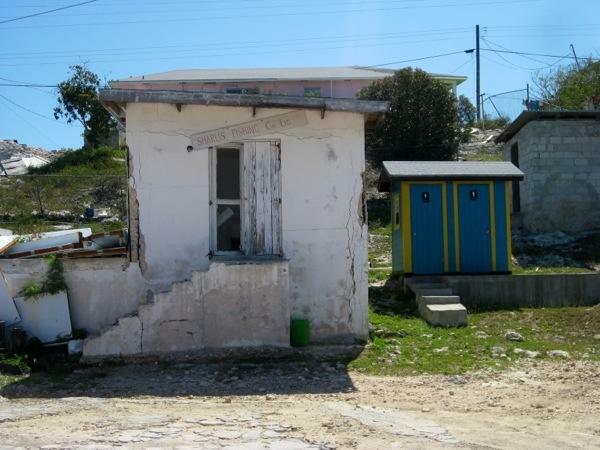 Percy and Elma are now building a new building which they hope to open as a new bar/restaurant and eventually add rental cottages. We chatted with Percy for quite a while; he shared his entrepreneurial ideas with us. We wished him luck in the pursuit of his dream and made our way back into town. Maxine opened the grocery store for us. The shelves were sparse, the mailboat was due to arrive in the next few days. Brian and I were able to restock our eggs and pick up a few canned items. Then we stopped in an adorable gift shop and chatted for a bit with Marjorie. Marjorie hand made most of the items in her gift shop; purses, handbags, coconut bangles, coconut earrings and necklaces, and pillows. Her work was magnificent! Marjorie encouraged us to continue our travels while we are still young. No problem! Back at Hog Cay before we settled in for the night Brian and I made a trip to the Hog Cay Yacht Club where we met George and Sarah (sv/Mirador) for sunset cocktails. Cruisers had fashioned this “yacht club” and it was awesome! 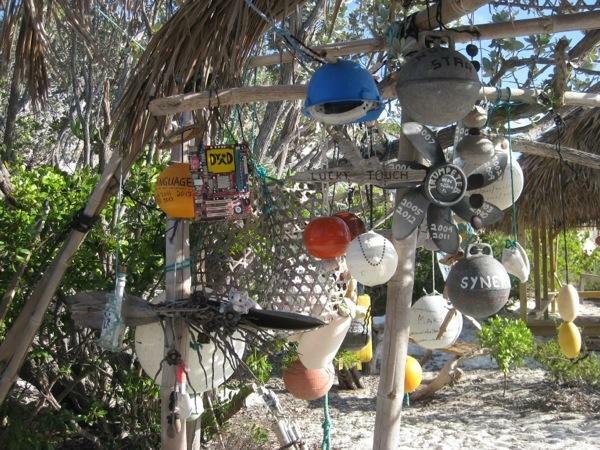 Everything was made from beach debris: nets, buoys, driftwood, etc. The neighboring building looked to be constructed of lumber with a newly thatched roof. 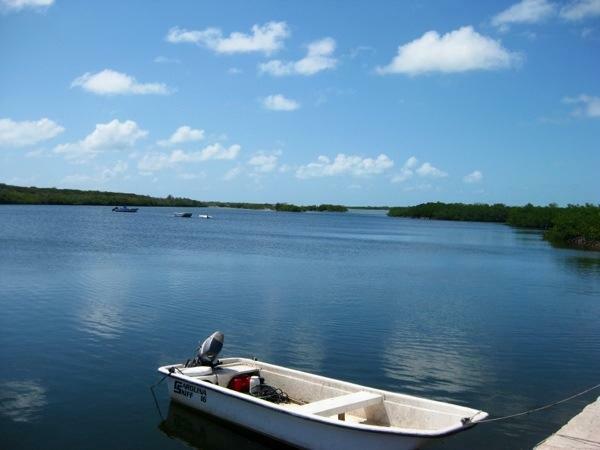 During the winter season we’ve heard there are about 8-15 boats that are the ‘regulars’ of Hog Cay. It seems they’ve been busy! 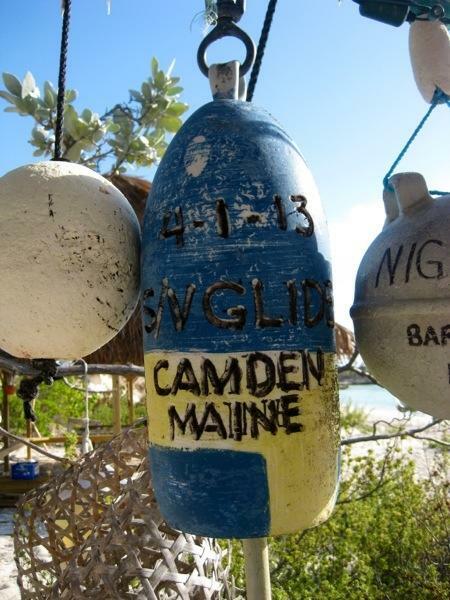 We browsed the buoys to see who’d visited and found our friends aboard sv/Glide had recently added to the mix. 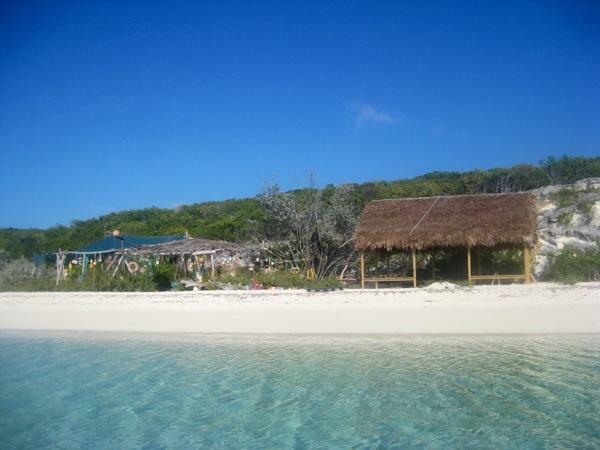 This entry was posted in Uncategorized and tagged 20130416, bahamas, hog cay, jumentos cays, ragged island by stephanie. Bookmark the permalink. WHAT??? no pic of the plane on the house? or was it gone in the fire?! I have heard so much about this place but never been blessed with pics!!! THANKS once again for sharing! I KNOW! I was so enjoying our chat with the owner and his wife I completely forgot to take a photo…the plane was not damaged in the fire and it was quite a site to see as the topper to a building!